Lieutenant Commander of the Islamic Revolution Guards Corps Brigadier General Hossein Salami announced that the IRGC operational units have been supplied with Iran’s new precision-guided long-range ballistic missile, Emad. 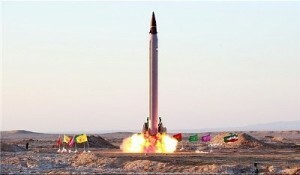 “Emad missile systems were delivered to the IRGC operational units,” Salami told FNA on Monday. He also said the missile will likely be used in the upcoming IRGC wargames. On October 11, Iran successfully test-fired the country’s new precision-guided long-range ballistic missile that can be controlled until the moment of impact. Emad carries a conventional warhead. “This missile (Emad) which has been fully designed and made by Iranian Defense Ministry’s scientists and experts is the country’ first long-range missile with navigation and strike controlling capability; it is capable of hitting and destroying the targets with high-precision,” Iranian Defense Minister Brigadier General Hossein Dehqan told reporters after the successful test of Emad missile. General Dehqan felicitated Supreme Leader of the Islamic Revolution Ayatollah Seyed Ali Khamenei, Iranian Armed Forces and the Iranian nation on the successful testing, and appreciated the scientists and experts of the Aerospace Industries Organization of the Defense Ministry. The Iranian Defense Minister reiterated that the mass production and delivery of Emad missile to the country’s Armed Forces will considerably increase their power and tactical capabilities. Defense analysts and military observers say that Iran’s wargames and its advancements in weapons production have proved as a deterrent factor. In November, IRGC Navy Commander Rear Admiral Ali Fadavi announced plans to stage massive wargames in the next few months.